Valentines’ Day M&M Cookies are loaded with milk chocolate M&Ms, are ultra soft, chewy and thick! Valentine’s Day isn’t really Valentine’s Day without some type of yummy dessert. 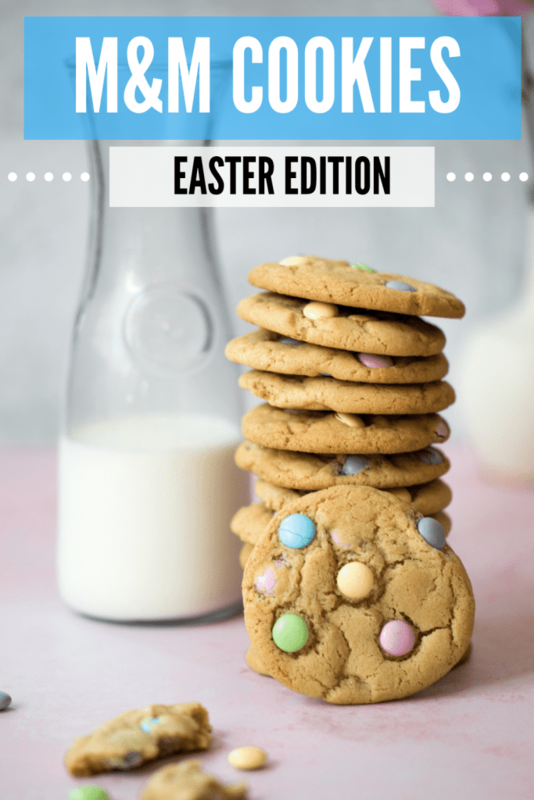 These perfectly baked cookies are studded with soft and melty milk chocolate M&Ms and are incredibly chewy. But why the duck eggs? Many bakers comment that duck eggs have a higher fat content that make cakes rise higher and when making meringues they turn out more stable and can get A LOT more volume. 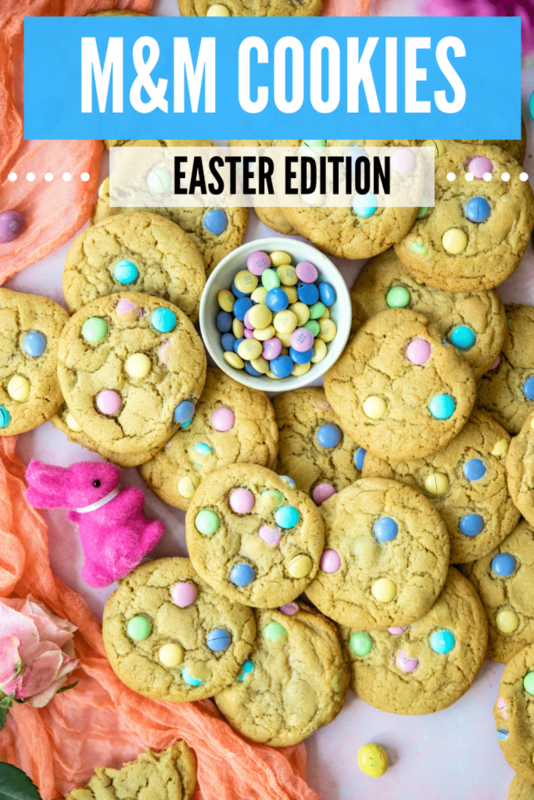 Duck eggs can make baked items fluffier than chicken eggs (POINT PROVEN WITH THESE COOKIES) – you will be amazed. You substitute one duck egg per chicken egg in the recipe, even though the duck eggs are bigger! Melt your butter: My next tip is to melt your butter in the oven. You’ll want to melt it for only 3 minutes so it only melts about half way. Not over beating the eggs or mixing the flour too long: When mixing in ingredients, try not to forget about what’s being mix! Keep a close eye, and mix juuuust until your ingredients become incorporated. Use a Silpat or silicone baking mat: KEY STEP! This is a game changer for you or the baker in your life. Cookies will never stick again or spread out too thin and it helps add to the fullness of the cookie! Target sells them for around $8 or if you want a Silpat they run around $20ish. Use an ice cream scooper to scoop out some BIG cookies! I know many people use a melon baller or a Tablespoon to measure cookies. 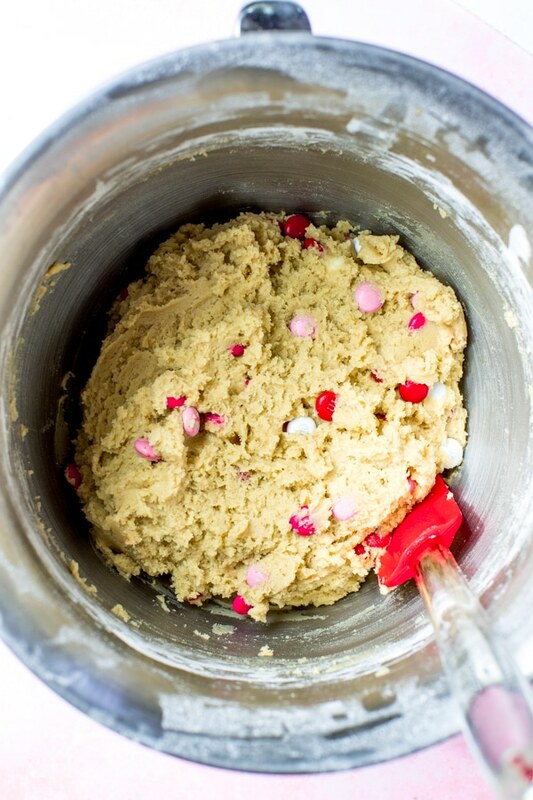 I use an ice cream scooper to make some big, thick and irresistibly delicious cookies. You’ll thank me later 😉 Be sure to give the cookies enough space to bake on the cookie sheet. Bake only 9 cookies at a time. Chill batter: recommended but not absolutely necessary if you pop your cookies in the oven right away. Chilling the dough helps create the puffy, thickness, fullness of the cookie instead of them baking flat and just blah. Cold dough = good dough! What kind of M&Ms did you use? 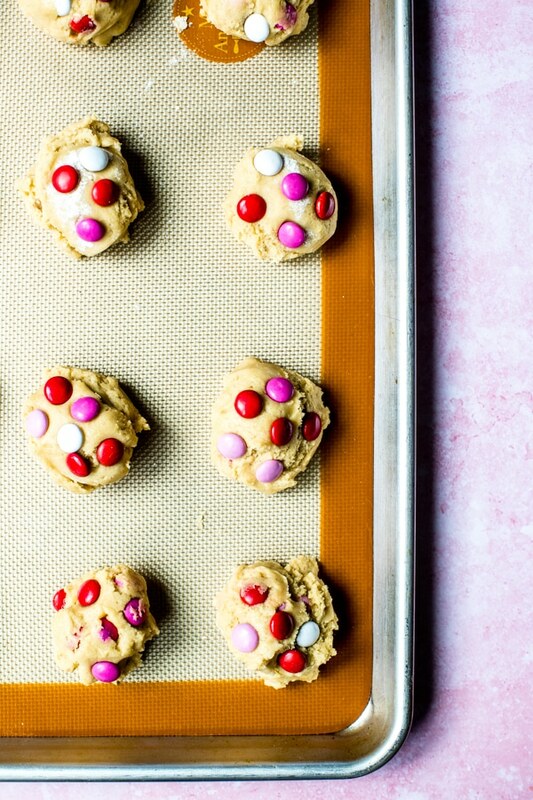 To make these Valentine’s Day theme cookies, use the “Cupid’s” seasonal M&Ms. 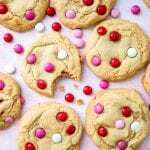 Not Valentine’s Day but still want to make these bomb cookies? Cool! Just use regular M&Ms – or chocolate chips! Christmas time? Use the Christmas theme M&Ms! Best temperature for baking cookies? I suppose this could go up for debate. But this recipe 350 degrees F. In my oven, these cookies take 12-13 minutes. Just until they rise enough with lightly browned tops! Note: Always bake until the recipe is done. All ovens, preferences, etc vary so don’t get too hung up on minutes on a clock; watch your cookies and bake until it’s done. Can I make the cookie dough in advance? Yes – prep the dough in advance and shape into the size cookies you prefer (Remember, the bigger the better!) If you leave the cookie dough in one large mass in the mixing bowl it tends to dry out. The dough can stay in the fridge 3-4 days before baking! Can I make these cookies into bars instead of cookies? I have never tried that but I am sure they will turn out just fine! Use a 9×13 inch oven safe baking dish – bake time will most likely increase. Check doneness with a toothpick! 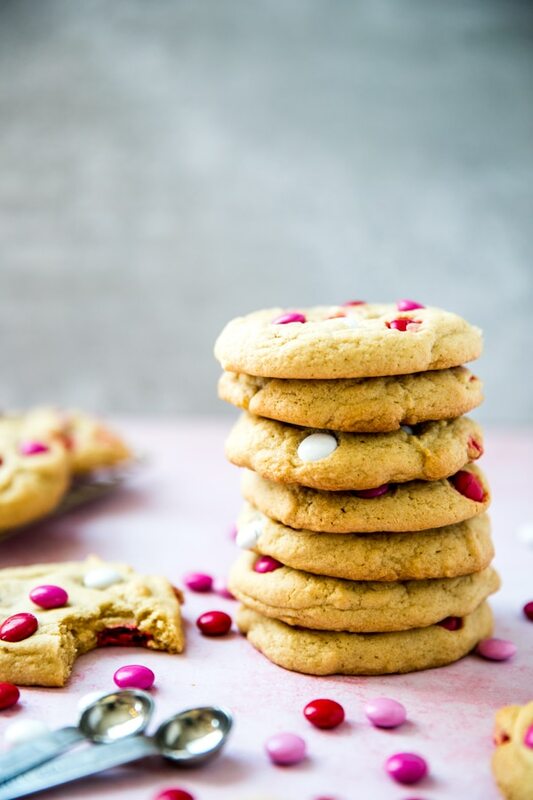 These Valentines Day M&M Cookies are chewy, thick, and ultra soft! 2 sticks butter, softened/partially melted 2 sticks = 1 cup or 16 Tbsp. 2 duck eggs chicken eggs will be OK too! 2 cups M&Ms Cupid theme for Valentine’s Day! Preheat oven to 350 degrees F. While oven is preheating, place your 2 sticks of butter in an oven safe dish to melt your butter half way! Set a timer for 3-4 minutes so it doesn’t melt completely. Once done, take the butter out an let cool about 4-5 minutes. In a stand mixer, you’ll them cream together the butter and both sugars until just combined. Then add in the eggs and vanilla extract. Be careful not to over mix. Then slowly add in the flour, baking soda, baking powder and salt until just combined. Stir in 1 1/2 cups M&Ms. Chill the dough for 30 min – an hour. Once chilled, then place your Silpat or silicone mat on a cookie sheet and scoop out your cookies. Make em’ big by using an ice cream scoop! Top with remaining M&Ms. Bake in the oven for 12-13 minutes, or until cookies are lightly browned on the top. (Note* these cookies are best under baked! Remove them from the oven about 1 minute before you feel like they are done). Remove from oven and transfer to a cooling rack to cool. To make the Easter edition, follow the same directions but swap the M&Ms with the Easter pastel color M&Ms. Note* these cookies are best under baked! Remove them from the oven about 1 minute before you feel like they are done. 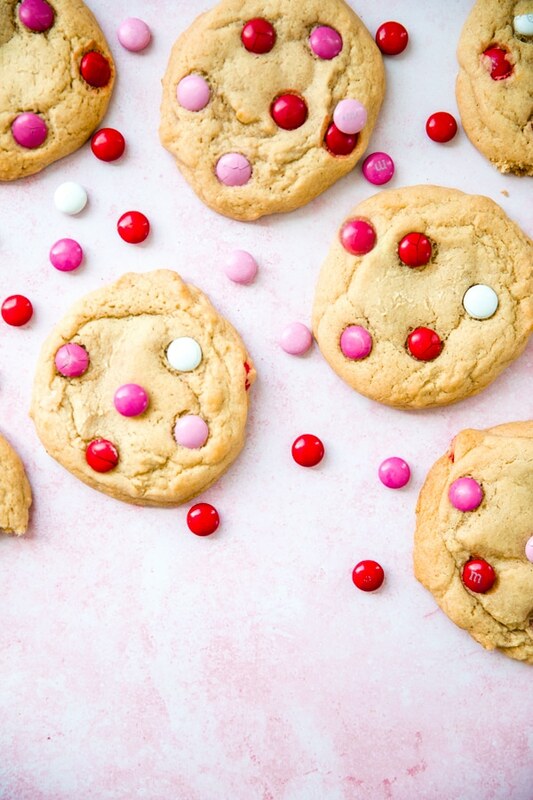 PIN THESE VALENTINE’S DAY M&M COOKIES FOR LATER! If you’re looking for more Valentine’s Day theme recipes I am sure you will love these Valentine’s Day Roasted Potatoes! Okay, I did not know that about duck eggs. Makes me want to run out to Whole Foods right now and see if I can find some! I’ve never looked for or even cooked with duck eggs, but now I’m intrigued. I made these cookies over the weekend, and I’m making them again for my son’s school party! So fun and delicious! Amazing, thank you so much Zainab!! 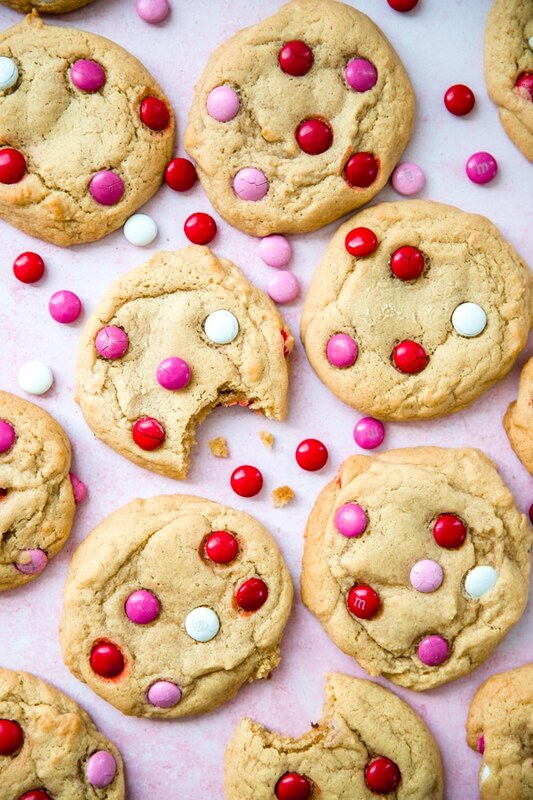 These cookies are perfect for Valentines Day! I will be making them send with the kids for their party. 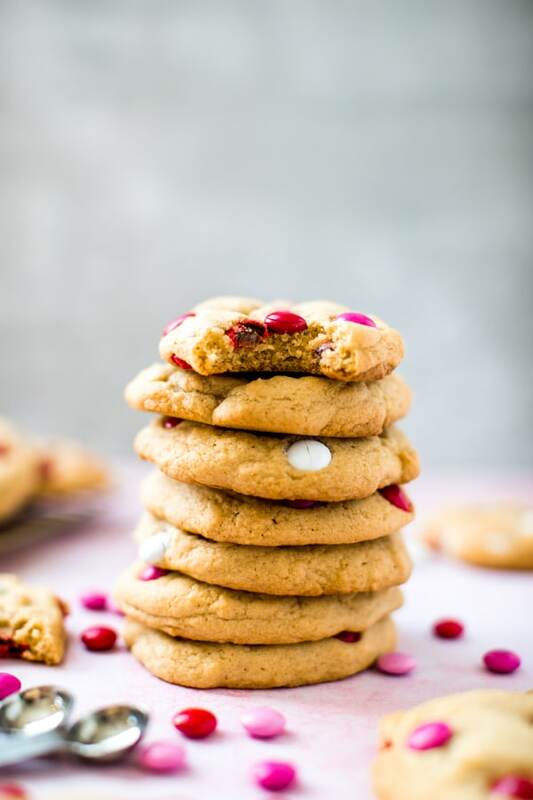 I love that such a delicious and simple cookie like this can be made so festive so easily! Thank you so much Ginny!! I’ve never had nor ever considered baking with duck eggs. What a smart way to add richness to baked goods! Thanks for sharing! Let me know what you think if you try it out – total game changer! 🙂 Thank you!